Glaucoma is a group of eye conditions that can lead to severe vision loss, and cause damage to the optic nerve, which conveys information from the eye to the brain. With glaucoma, increased intraocular pressure (IOP) can harm the optic nerve, resulting in a loss of peripheral vision in one or both eyes. According to the National Institutes of Health, glaucoma is the second most common cause of blindness in the United States. Glaucoma is not one disease, but many, all affecting the fibers of the optic nerve. This can cause changes in vision ranging from the subtle to the severe. Although glaucoma cannot be reversed, it is treatable and even preventable. Glaucoma can be diagnosed by our optometrist in a standard eye exam. The front part of the eye contains fluid called the aqueous humor, which drains from the eye through channels in a region known as the anterior chamber angle. When these channels are blocked for any reason, intraocular pressure rises, which can result in damage to the optic nerve. Glaucoma can occur in people of any age, even infants, and a secondary form of glaucoma can be caused by certain drugs such as corticosteroids, some systemic diseases, and even trauma to the eye. It may occur gradually over a long period of time, or suddenly, in an acute form that requires emergency assistance. It can also be present at birth. Heredity and ethnicity may play a role, and so can the development of the eye itself. During routine a comprehensive eye exam, your eye’s intraocular pressure (IOP) will be measured with an instrument called a tonometer. One type of tonometer uses a small probe which gentle rests on the eye’s outer surface, while another type uses a quick puff of air (non contact tonometer). An abnormally high IOP reading indicates a problem with the amount of fluid (aqueous humor) in the eye. Either too much fluid is being produced, or it’s not adequately draining from the eye. As a result of the excess fluid, pressure builds within the eye. The excess pressure can then cause damage the optic nerve. Normally, IOP should be below 21 mmHg (millimeters of mercury). 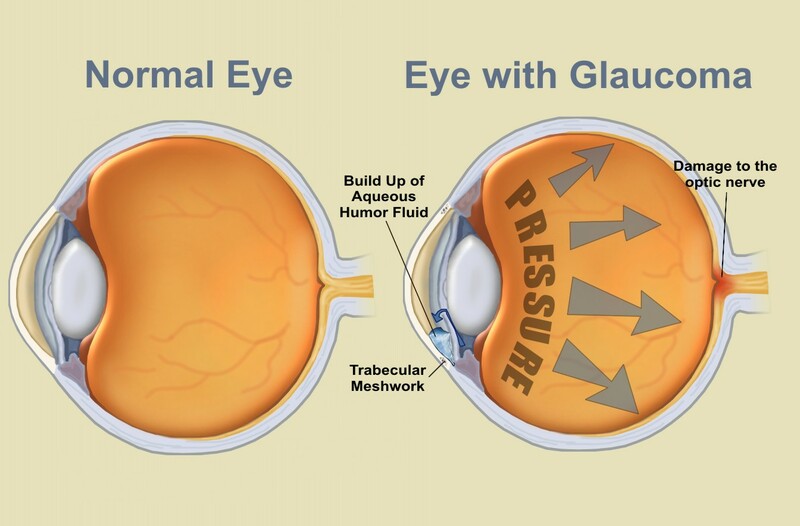 If your eye’s pressure is higher than 30 mmHg, your risk of vision loss from glaucoma is 40 times greater than someone with intraocular pressure of 15 mmHg or lower. There are several different treatment options available for patients with glaucoma. The first line of treatment usually involves the daily use of eye drops to lower the intraocular pressure. Depending on the severity, there are also several surgical options available to manage glaucoma.